This beautiful Tuscan-style sheep's milk cheese from Lenberg Farms is made with 100% Ontario Sheep's milk, in the burgeoning region of artisanal Canadian cheese making. Aged for six months in temperature and humidity controlled maturation rooms, the cheese develops a semi-firm, smooth and slightly crumbly texture while maintaining its creamy, mellow yet somewhat piquant taste with earthy undertones. Wonderful as an alternative to Italian Pecorino cheeses. 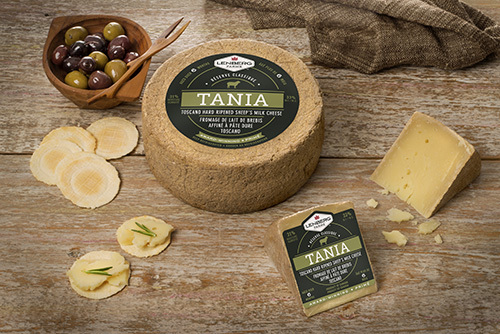 Applications: Try Tania Toscano Sheep's Milk Cheese in a perfect party appetizer of mini paninis! Take a baguette and slice sandwich halves, fill with roasted turkey, sun dried tomatoes, arugula and slices of Tania for a cheesy, delicious bite-sized treat! Pairings: Wonderful with a hearty Chianti or a toasty, golden Bière de Garde.